When I say the word ‘Florida’, what comes to mind? What if I was to tell you that Florida is also a hotbed for would-be game designers. Florida is home to some of the creators of the most popular video game franchises in history, most notably the Football powerhouse: Madden. To complement its flourishing gaming industry are some of the top schools for game design students in the country. But finding the best school for you isn’t as easy as it sounds. In the intro we covered the most obvious reasons. The average temperature is 82 degrees year round and the state features over 600 miles of beachfront. This is cause for most people to move here however; this state has so much more to offer, particularly to those of you interested in the entertainment industry. This means that qualified graduates will have plenty of opportunities upon completing their program. Another reason to consider Florida is the fact that there may come a point in your career that inspires you to explore other opportunities. Depending on your interest, you’ll find many other jobs in the state, which require a similar skill set, like the animators at Disney Studios. 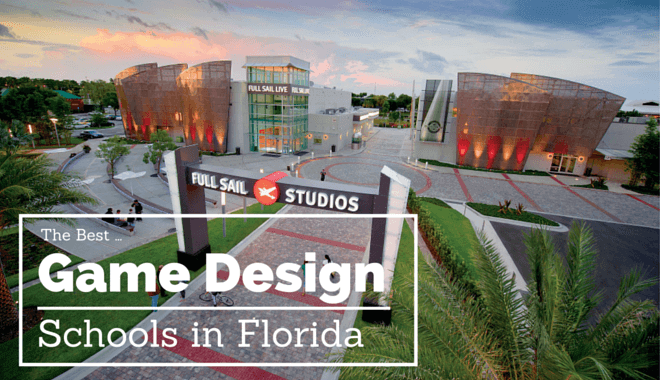 What are the best Florida Game Design Schools? Often referred to as FAMU, this four-year pubic university located in the capital of the state makes the college wish list of thousands of graduating high schooler all around the country. Some come for the beautiful weather while others come for the sports however, you as a video game designer may be interested in the university’s world-class graphics design degree. Unlike some other schools, which offer a Bachelor of Art for graphic design majors, FAMU offers a Bachelor of Science to their majors. Students who attend this rigorous design program will be exposed to many computer graphics and illustration courses to aid in vastly expanding their knowledge. Incoming freshmen should have a minimum GPA of 3.0, as this school is somewhat competitive accepting just over 40% of applicants. Compared to some other schools, FAMU is slightly cheaper ranging from roughly $20,000 – $30,000 per year. If easy access to world-class beaches is one of your requirements, Miami International University of Art & Design should be seriously considered, as this school is located minutes from Miami Beach. It offers two different paths for aspiring game designers to take, either Computer Animation or Graphics Design. Either one of these two programs will provide you with the solid foundation many game makers seek from their entry-level employees. And due to is prime location many gaming and entertainment conventions and workshops are held throughout the school year. UF is a large four-year university, which got started in 1905. Since its humble beginnings, it has grown to become one of the most respected schools in the United States. For video game design students the Digital Worlds Institute (apart of the UF’s Arts program) is the mecca of game design as it has become home to one of the top game design schools in the entire nations. Often called SAGE this program is almost unmatched when it comes to undergrad education. With many courses on 3D modeling, interactive design, and animation students who attend this school are sure to get their moneys worth. As to be expected, the competition to be accepted into this program is fierce. To make yourself standout your graduating GPA should be a minimum of 3.45. As with many world-class universities, tuition is quite expensive, costing upwards of $40,000 a year for out-of-state students. The DAVE School was founded in 2000 and had its first full class in a custom built triple wide trailer on the back lot of none other than Universal studios, Orlando. The school has grown since then to take up all of the Universal’s Sound Stage 25 where students can earn one of a dozen degrees in the fields of Game Production and Visual Effects Production. The school also has many notable alumni, including several Oscar nominees. The Game Production program offered here is designed to give students intensive career training in the main areas of game production. The program is divided into blocks, which include: Digital Modeling and Sculpting, Animation Fundamentals, Game Asset Production, Game Engine Fundamentals, and Video Game Production. The school also offers three other Visual Effects Production blocks that are useful for game development: Modeling & Sculpting, Animation Fundamentals, Visual Effects, and Studio Production. Graduates of The DAVE School find themselves working at some of the top game studios in the world. Some of them are BioWare, Activision, Electronic Arts, Monolith, Trion, MindWalk Studios, and Naughty Dog. The program also boasts an impressive faculty including Emmy award winning artists like Tom Bremer. Note that information concerning housing and tuition costs is nowhere to be found on their site, including the Frequently Asked Questions Page, which more often than not means that it costs more than the average school to attend here. Ringling College of Art and Design is a private college founded in 1931 and with an average undergraduate attendance of around 1,400. Four-year degrees are currently offered in the following fields of study: Advertising Design, Business of Art & Design, Computer Animation, Film, Fine Arts, Game Art, Graphic Design, Illustration, Interior Design, Motion Design, and Photography and Imaging. The Bachelor of Fine Arts in Game Art gives students the tools and training needed to develop professional artists skills useful for creating attractive and engaging digital games. The program focuses on in-depth studies of game design mechanics and meaningful play along with interactivity and how artists create and improve game content. Students also get hands-on training in a number of 3D animation software and game engines. By the end of the program you’ll know how to use the latest technologies to create gaming environments that are texture-rich, visually attractive, and capable of entertaining, educating, and telling a story. As a private school, Ringling College of Art and Design has a fairly steep tuition cost compared to other schools. In 2015, undergraduates paid around $41,480 a year, which doesn’t include housing, fees, etc. The acceptance rate as of 2015 is around 70%. In 2013, 61% of the enrolled students were female while the other 39% were male. The Digital Media Arts College was established in 2002 to help artists focus their creativity and enhance their artistic skills in preparation for a successful and promising career in any digital media field. A number of undergraduate programs are offered in various disciplines and levels, including Associate degrees in Graphic Design and Multimedia Design, Bachelors degrees in Computer Animation and Graphic Design, and Masters Degrees in Graphic & Web Design and WEb Design & Technologies. A number of online programs and professional certificates are also available. The Bachelor of Fine Arts in Graphic Design prepares students for a job in web design, advertising design, motion graphics, package design, art direction, magazine design, and more. Students are also required to create their own portfolios that showcase their own creativity, skills, and style to potential employers. Aspiring game developers might also be interested in the Bachelor of Fine Arts in Computer Animation. The skills you’ll learn during this course include everything a studio will expect from an animator: 3D modeling, animation, lighting and texturing, technical direction, and concept art. This degree also touches on other areas of the animation design process such as screenplay writing, storyboarding, cinematic lighting, and modeling, texturing, and animating characters and environments. UCF is a large public university with just under 60,000 enrolled students. It offers many programs which video game design students may find beneficial however; the most relevant is the Digital Media major offered by the School of Visual Arts and Design. This Bachelor of Arts degree allows students to integrate technology, storytelling and art into one curriculum. Unlike some other universities, students focused on game design here will be required to learn about both the artistic and technical side of the industry. This is because the along with the typical game design classes, students are required to take quite a few introductory level programming classes.This fundamental understanding of both sides of the process is sure to give you the edge over other applicants when it comes time to apply for jobs. Though competition is rather lax compared to other schools, the $20,000 tuition can be a challenge to some out-of-state students. FIEA is a graduate video game development school that provides students with a choice of several accredited master’s degrees in interactive mediums. It is directed by the former vice president of Tiburon studio and offers programs in several areas of study, including the game art, game design, game programming, and game production. At FIEA you’ll receive an intensive, project-based gaming education that offers a taste of what they can expect while working at an actual game studio. Students are often placed into teams of fellow peers and asked to take on different roles such as programmer, product,er and artist. These projects involve milestones and tight deadlines to simulate an actual game production pipeline, and it is all overseen by people who have either been teaching game design for years or have actual experience making games for a living. Three tracks are available to students enrolled in the program. The Art track covers everything from modeling, shading, rigging, and lighting to texturing and motion capture editing. The Production track teaches you how to manage teams of game developers while dealing with problems concerning marketing, low morale, and distribution. The Programming track teaches students how to write game engines, port games, and deal with issues such as memory management. This prestigious university has been in existence since the mid 19th century. Famous alumni include rock star Jim Morrison and fitness guru Richard Simmons. Now the school is famous for both its rigorous academic programs and championship winning sports teams. 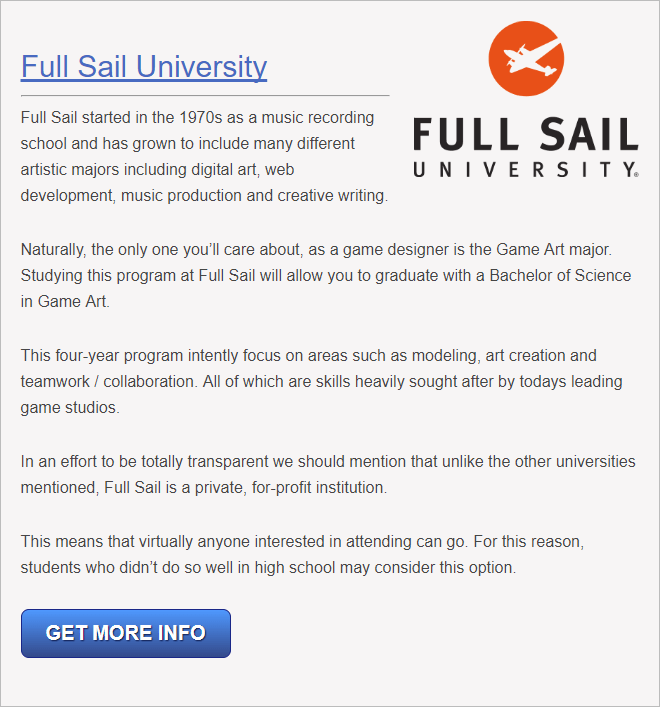 To go along with all of that, this school is home of one of the best game design courses in the country. These courses are offered by the Program in Interdisciplinary Computing or PIC for short. In these courses students learn the basics of implementing real-world video games. The goal is to give you a comprehensive overview of all of the processes involved, from 3D game design to working in a collaborative environment. Although FSU is a large school of over 40,000 students it only accepts just over 40% of all qualified applicants. Tuition can be as low as $19,500 for in-state students or as much as $35,000 for out-of-state students. UM is a medium-sized university with just over 16,000 enrolled students. This school finds itself on the wish list of students both foreign and domestic. This fact should come as no surprise because the university is home to some of the best programs in the world. Game design majors will likely become a member of the Interactive Media program. Here students enroll in extremely demanding courses, which cover practically all aspects required to start a career as a competent game designer. Both artistic and technical subjects are covered in great detail. These fundamental skills will position you to better handle many of the difficult challenges the industry currently faces. As with many ‘big name’ schools, UM is not what many would consider affordable as the average tuition is about $21,000 per semester. Animation, game design, and visual effects jobs are available all throughout the state Florida. For this reason, many residents find they come to the state for college and stay for the employment opportunities. This is because Florida is one of the most creativity driven places in all of America, rivaled only by parts of California and New York City. Such situations are perfect for creative types because it means you’ll have an endless supply of work. This is true because many types of businesses, not only gaming studios rely on the talents and skills that only the most creative people can bring. For this reason those of you who excel at these creative challenges are all always in high demand. Any student interested in such a lucrative opportunity is encouraged to check out each one of the schools mentioned on this list as they are sure to propel your skills and abilities to the next level.